It had the best controller, it had the worst controller. The notoriety of the stock Atari 5200 controller cannot be overstated. It had a floppy, non-centering joystick. Fire buttons were mushy, unresponsive, and stopped working after a few intense sessions of your favorite shooter. The design was so bad, if fact, that if you did mange to keep it all working, you were pretty much guaranteed to develop an RSI within a week owing to the abominable ergonomic design. The stock controller was ranked as the 10th worst video game controller by IGN editor Craig Harris. I am truly surprised it did that well. On the other end of the spectrum was the Atari 5200 trak-ball controller. The Atari 5200 trak-ball is big and heavy: it's nearly as big as the Atari 2600! The ball is about the size of a tennis ball, so while it's not "arcade-quality" it's a lot more substantial then the standard ping-pong sized balls commonly used for home trackball controllers. Most importantly, the Atari 5200 trak-ball works fantastically with all compatible games. 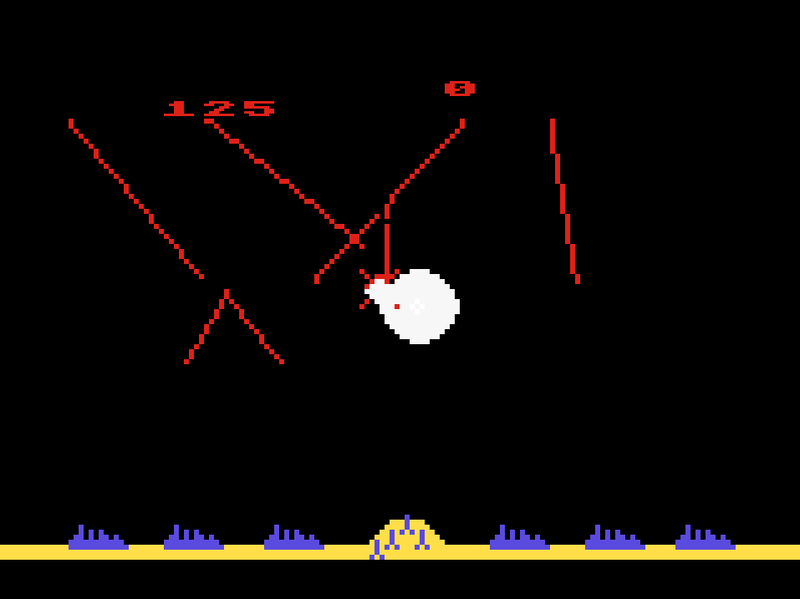 The most recognizable of which is the 1980 arcade classic Missile Command. 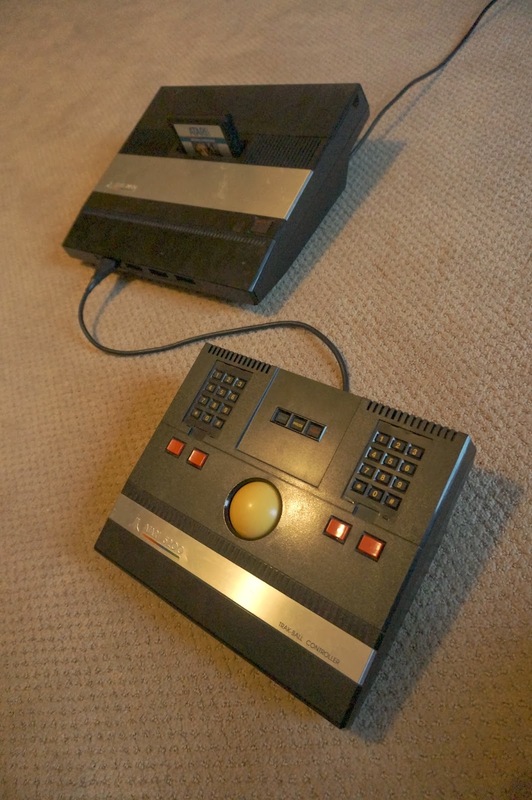 Atari 5200 trak-ball controller (left) shown with the Atari 2600 (right) for scale. One would think that Missile Command needs no introduction. Looking over the decades-old manual, however, I found a provocative and rich back story. You are a missile commander on the resource rich planet of Zardon. Armed with antiballistic missiles from a central missile bunker, you aim to defend the six principle cities of this peaceful planet. Unfortunately, the neighboring Krytolians stuck on the resource poor planet of Krytolia, have decided to launch an all out war on Zardon to capture its precious resources for the glory of Krytolia. As the commanding defense officer, you must deploy quick thinking and strategy to defend Zardon against the Krytolian onslaught. Missile Command is more than just a simple shooter, it is complex, hot-conflict simulation, modeling the fallout of the Krytolian's greed to seize the Zardonian's valuable resources at any cost. To be honest, this was already a fantastic game on the Atari 2600. The relatively straightforward arcade graphics translated very well to the more modest capabilities of the Atari 2600. Two simplifications, however, were made. 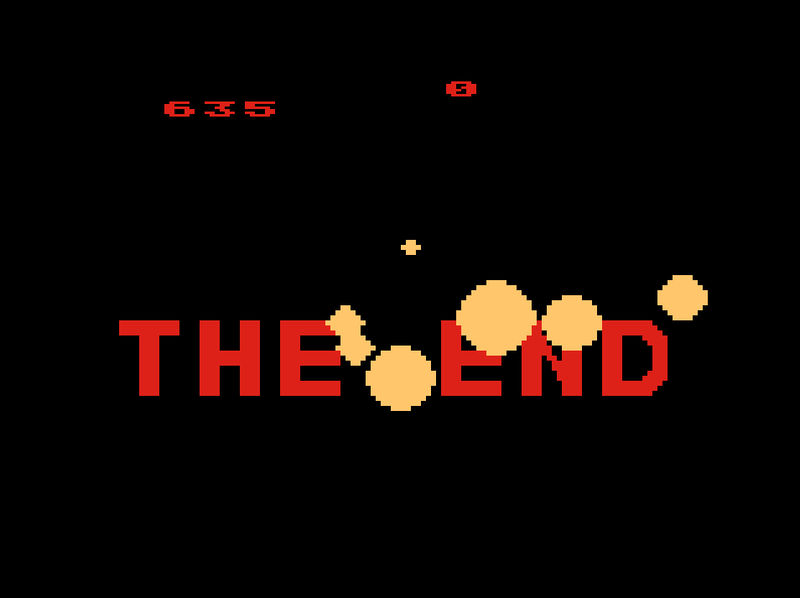 First, the number of missile bases was reduced from three in the arcade version to one in the Atari 2600 version. Second, many users used the standard Atari 2600 joystick to move the targeting icon around the screen rather than the slick trackball that the arcade version used. While the Atari 5200 version has one missile base like the Atari 2600 version it also has a massive trackball to help you aim your antiballistic missiles with pin-point accuracy. Playing Missile Command on the Atari 5200 with its "trak-ball" controller is about as close as you can get to reliving the early 80's arcade experience without the arcade cabinet. Unfortunately, the Atari 5200 trak-ball is getting harder and harder to come by. I purchased my Atari 5200 in March 2013 through eBay, and quickly tried to buy my own authentic Atari 5200 trak-ball. After several unsuccessful eBay bids, I contacted Best Electronics. Best Electronics specializes in replacement parts and accessories for all Atari Game Systems. The webpage looks a bit dated, and ordering can be a bit convoluted, but their extensive inventory makes the effort worth it. When I contacted them to see if they had any Atari 5200 trak-balls in stock, they told me that after 27+ years of selling the Atari 5200 trak-ball, they ran out of stock the week before I emailed them. Talk about poor timing. In the end, I did find one on eBay, but I paid a little bit more than I would have liked. The good news is that even without the 5200 trak-ball controller, the game still plays well with the stock controller. As with most early arcade games, ultimately, resistance is futile. The Krytolians invasion is just too powerful, and all major cities eventually fall. I'd like to think that as the last explosions wipe out the final defensive position, a few proud, strong Zardonians survive to continue the good fight. 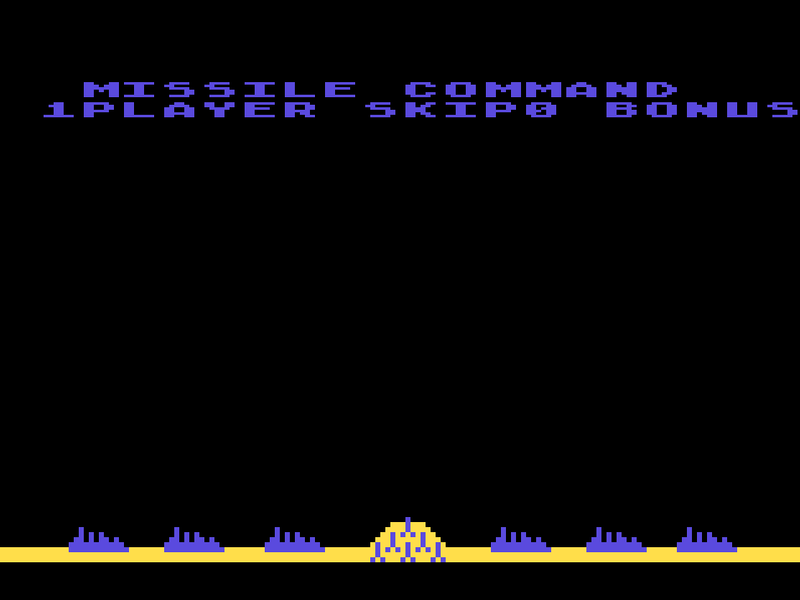 Opening screen for the Atari 5200 version of Missile Command. The central antiballistic missile compound and six cities to defend can be seen along the bottom of the screen. Practically speaking there is little difference between this screen and the Atari 2600 version. The Krytolian offensive begins. An enemy satellite can be seen exploding in the center of the screen. The famous Missile Command game over screen. The words "THE END" are engulfed in a final nuclear bombardment. The finest way to play old-school Missile Command on the small screen: Atari 5200 with the 5200 trak-ball controller. Retro Game Rankings: No Quarters to Four Quarters. It should be noted, that although the going price of an arcade game was a single quarter when many of these games first came out, I feel that true retro game fans would be willing to pay a little bit more to capture the glory of playing some of the truly great ones one more time.